A glimpse at the London Tube’s night map for Zone 1 service. Every now and then, I like to check in on how some of the other global subway systems are faring. Today, we have some interesting news out of the United Kingdom where Boris Johnson and Transport for London have ushered in a move long necessary. As far as mad rushes go, it’s quite a sight to stand in Trafalgar Square a little before 12:30 a.m. on a Friday night as Londoners and tourists alike stream through the fare gates in an effort to catch the last Tube train home. TfL makes its operating hours very well known, and as that last train time inches closer, walks become jogs, jogs become sprints. That is one train no one wants to miss. 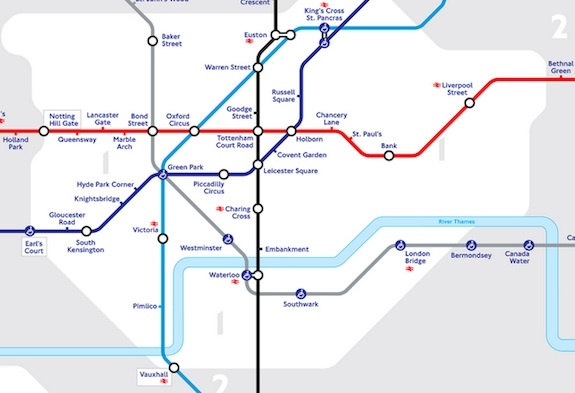 Because the Tubes don’t run for five hours every night, London is a relatively early town. The night owl bus service is far superior to most cities’ bustitution plans — Boston, I’m looking at you — but restaurants and bars close up shop far earlier there than here. It’s always been a sore subject for Londoners, but change is a-comin’. The 24-hour service will start in 2015 on five lines during Friday and Saturday nights and is expected to eventually be extended to other lines and nights of the week. Among the pilot lines are the Piccadilly, the Victoria, the Central, the Jubilee and important sections of the Northern. Ticketing and the current system of payment cards, known as Oyster cards, will start to be phased out next year, when the Underground will encourage passengers to move to a system of direct payments by using bank debit cards. Already, ticket offices sell less than 3 percent of the tickets used for the system, down from 10 percent 10 years ago, Transport for London said. This is a small story, but there’s a lot going on here. Besides the welcome news that Tube service will run throughout the weekend on some of the busier lines, that London is phasing out the Oyster card before New York even adopts a contactless payment system is intriguing. London is looking to a bank card-based system just as New York is. Hopefully, the two transit systems are keeping each other appraised of their moves and the payment standards. So London gets its 24-hour subway, finally, in 2015, and the Oyster Card will go the way of the token. Our MetroCards will be around through the end of this decade, but at least we’ve had overnight train service since the beginning. I’ve been shuffled out of places earlier than I would have liked on multiple occasions while traveling in London and it’s nice to hear they are “closing the gap” in service. The “last train home” has often been a bane to the existence of many a late night travelers, including people who live out in sububan New York/New Jersey. A “bank card based” system is completely unacceptable. I understand that England has debit cards with some form of technical security and significantly more legal security than ours, so in England (unlike the US) it is reasonable to use debit cards. But even in England, *not everyone has access to debit cards*. It is completely unacceptable to go to a system which shuts out the “unbanked”. It would be different if the Post Office Bank were still running, offering zero-fee checking accounts with free debit cards to everyone in the country. The result is that it is absolutely essential that any transit system offer its own payment medium which people can buy with cash. Does the U.K. have anything similar to ChexSystems? That can make it nearly impossible for many people, especially poor people, to get a bank account in the U.S., if they ever make a mistake. If you mean credit reference agencies then yes we have those. But we also have ‘basic bank accounts’ which almost anyone can get despite having a bad credit history. They don’t permit over drafts for example but many come with a debit card. The last Labour government encouraged banks to set them up on a voluntary basis to help try and reduce the financial divide. The banks of course complied because the alternative would have been to impose them via the regulatory regime with more onerous conditions. Though some call it one, ChexSystems isn’t exactly a credit reporting agency so much as a tracking system for tracking banking abuse. Basically, if you overdraft or write a bad check and have your account closed as a result, you could get reported like you would for a bad loan, but the service is a bit controversial because it doesn’t allow you to get the information off the report or balance it with positive information. The result is poor, vulnerable people often don’t even have access to even basic checking and savings services. Since this is going to be a limited 24/7 roll-out, it should be interesting to see how it positively or negatively affects property values for London businesses and residences that are or that are not on the lines operating all night. In New York, while the Manhattan trunk lines in general are going to have the best overnight service, all lines are served overnight. As for the payment system, I’m still at a loss to see how the MTA, London Transit or any other system is ever going to go completely cashless, since to have no way of purchasing entrance at a station without a credit card or with a RFID card for direct entry does threaten to shut out a not-insignificant number of people from using a publicly-funded system (Some toll roads have gone to nighttime wireless payment only at less-used exits, but those also have cameras to take license IDs for later billing if tag-less cars use the exit. You can’t really do that with subway riders, pictures and mailing bills to their homes, and it would be kind of creepy if you could). I haven’t seen any of these systems say there would be no way to buy a fare with cash. Even if their primary system is going to be based on bank cards or mobile phones or whatever, that doesn’t mean it will be the ONLY way to pay. But there has been some talk in New York of the MTA hoping to get out of having to deal with money collection entirely, through elimination of the current Metrocard vending machines and going to some sort of RFID or direct swipe/tap card system. If that’s the case I’m still not sure how you ever get there on a 24/7/365 system without creating obstacles for those without cards to use the system. I can see one way it can be done – if the cards were issued through social service agencies such as Light Housefor the blind or department of the aging. It would be similar to the benefit cards used for such programs as food stamps, but in this case for transit. I am thinking about kids, school kids, etc. The idea of letting your little kids or young teens have a credit card to use the subways – just does not seem “right”. School bus passes or transit passes do not have the same “feeling” as a direct paying card from one’s credit card account. LOL. Just a thought about some features of a possible system using direct debit cards on the subways and buses. Just one of the details to work out. POP can always replace barriers, though it doesn’t seem so practical on the subway. L. A. had POP on the subway routes, but they have moved to turnstyle payment since they transitioned to their TAP card. Yes, and they didn’t need to; that was pure Cubic pork, same as what’s happening now in Vancouver. The Port Authority is using EZPass exclusively at the Palisades entrance to the GWB on the overnight. Same with the lower roadway approach. The MTA has also gone to exclusive use of EZ Pass for the Henry Hudson bridge, so the move to cashless tolling is already upon NYC metro drivers. Tolls are then billed to the address of record for the license plate holder. As you said, that system doesn’t work for an individual seeking access to the subway system. I’ve read in several places that some transit agencies are looking at smart phone readers for fares. NJ Transit has expanded its pilot program for paying fares by smartphone (doing so avoids the ticket agent adding the penalty fee for buying fares on the train). NY Waterway also has a smart phone app for fare purchasing. This might be a way forward on this front. Portland OR is also rolling out a smartphone app to handle seamless transit fares. In adition, TriMet will be adding smartcard payment, but they chose to go the phone route first. Whether you’re getting your fare credited to the MTA via a card from Chase or Citibank, or via a smart phone through Verizon or AT&T, I’m sure the system would be workable for 90-95 percent of the system’s current ridership. It’s the last 5-10 percent that’s going to be the problem, if the MTA is going to keep the system accessible to them on a 24/7/365 basis (as with the current Metrocard surcharge or the original cash discounts, you can toss a lot of carrots out there to entice people to the completely cashless payment system, but my guess is the MTA would be in court about five seconds after they said they would no longer accept cash for payment to enter the subways). Not everyone has a smartphone either. Also unacceptable. There has to be a way to accept cash. If there isn’t, well, turnstile jumping will become legal. It’s not 24/7, just weekends. It’s not viable nor necessary on weekdays, and that’s from someone who lives in London nowadays. San Francisco has pretty good owl service. Back when I lived in Oakland and before I realized there were late night transbay owl buses I used to ride the SF ones around after the bars closed before BART re-opened. The Oyster card is unlikely to go away anytime soon, some of the press seem to have gotten a little confused over this topic: http://www.mayorwatch.co.uk/tf...../201328006. Some of the related articles there are worth a read to see how the current rollout of contactless payment on buses has gone. At the moment they will be just enabling bank cards to be used by the fare gates. n the future they will allow people to add their travel cards onto them. The aim is to transfer a large percentage of passengers onto a bank card based system. But there will always still be an Oyster based system available for the non credit worthy. It’s just the current system is straining under the load of transactions, with all the different networks and different types of fare structures for the bus tube and rail system and it’s now quite expensive to operate. They are currently designing a new system thats much cheaper to run and trying to offload a significant percentage to the banks. I just don’t think there’s any chance they will implement any system that will not allow for people to enter a station with cash and buy a ticket. Will they offer incentives to people that use the more efficient means? Probably. But at least for our lifetimes, I’m pretty confident you’ll be able to walk into any station, 24/7/365, with cash and be able to buy a subway ticket. I would love to see a study of how the economy benefits (versus the cost of running overnight service) especially compared to night owl service. This is a good thing for London. It will be interesting to see what effect overnight service will have on the Tube’s impeccable stations (I expect none) which will chip away at the argument that we in New York cannot have 24-hour service and clean stations too. Of course it has nothing to do with New York’s station conditions. You can always close a single station or part of a line to clean, probably during the course of routine track maintenance. New York has overstaffed customer service and train crews, and it seems understaffed cleaning crews. So, not 24/7 at first, and perhaps not ever. Not quite comparable to NYC. Stations are cleaned during the day – removal of litter, abandoned newspapers etc. More in depth cleaning – wall/floor washing happens during the night closures and there will still be 5 nights a week for that to happen on the affected lines. I’d imagine some re-jigging of staff rotas and transfers from other lines to enable this to happen. How will unlimited rides work with bank cards? Or will the concept of unlimited rides go away along with the Metrocard? The same way it works now. You prepay for a certain period of time. No, from what I understand, London has a cap. After you spend x amount in a day, any additional trips are free. You can either pre-pay and buy a paper unlimited ticket (travelcard), or you can pre-pay on Oyster for longer tickets (7 day, 1 month etc), or you can maintain a pay-as-you-go balance on Oyster. The daily cap on Oyster is the price of an unlimited travelcard for the zones you travel in, single fares are deduced from your Oyster balance as you use it until you hit the cap. In other words, it’s always cheaper or the same price compared to a paper travelcard to use Oyster. What every city needs to do is simply put in the transit smart chip in ID’s. Drivers license, state ID, etc. You live in the state? You get an ID. Now you can ride transit without having to worry about some other card. You’d tie it with your funding source online. Of course, not everyone has or is able to get an ID. In SF, the fare machines sell you tickets that have a contact-less chip inside. Seems simple enough to operate a single traditional cash->ticket fare machine in all stations, for those without ID and tourists. Fantastic. Now MBTA can stop their idiotic excuse that overnight service is not possible in an old system without express tracks. Mind you, they’ve obviously never heard of PATH or PATCO. but they might recognize LA and London. Great, so now you have to have an ID card to get cheap transit fares. The soft, capitalist form of Papiere, bitte. We don’t have ID cards in the UK. There were plans to introduce them (voluntary) by the last Government but they were abandoned by the current one even to the extent that the IT equipment used to store the data was physically destroyed – not just wiped and over written the hard drives etc etc were physically smashed! The only government issued ID I have is my passport and there is no way am I taking that out with me on a night out ! No ID. While some people may have good reason to be tracked by the subway system (it proved the innocence of several falsely arrested people), people who choose to enter it without ID should be able to. Not everyone can GET ID — people whose birth certificates are lost have particular problems. What’s wrong with Metrocard. The system has it’s flaws but it’s better then token since Philly still uses it. Nope. Token always works, doesnt lose your money, and is faster to pay with. Token is cumbersome to carry. Same is true of the awful Parisian carnets. Having a spare token tucked into your wallet meant that you could always get home, so long as your wallet was not stolen. No matter whatever else happened during the day or night, having a token meant a ride home. Nor did having a token rely upon some electronic only machine readable card – smart or not. One could always count their tokens -at any place or at any time, and without using any electricity for the “green” or ecology-minded – to see how many rides are available. Tokens did not depend upon any kind of programming or computer-based technology. Every kind of technology has their benefits, even if their time has past, and other methods have been chosen. What’s wrong with MetroCard? You mean besides cards wearing out, expiring, getting double-charged, “please swipe again”, “just used”, etc? Tokens may have some advantages but even SEPTA is transitioning away from tokens to contactless technology. I don’t think that the MTA knows what it wants – bureaucrats tend to think about what they do not want instead (that which shows one up in a bad light). In the fare payment world, there seem to be enough negatives to cover all payment methods, even the “free” (i.e, no) payment method. So whats a ‘crat to do? I think that they should start designing faregates that accept modules for multiple payment methods. The modules would include something that can read/write mag strips like a metrocard (and while they were at it, perhaps maybe better and/or smarter than current ones), including of course, actual metrocards as long as they are in use. Other modules could process other types of payment, such as RF, smartphone, fingerprints, retinal id, voice, scent, esp – whatever you can think of, complete with reliable connections to a heavy metal mainframe to process the data in acceptably real time. This way, there would be an assortment of payment methods available at the station, maybe one of them would be working. If the MTA wanted to go to a system where single ride tickets were too costly to be disposable, they could set up the module to capture the card for possible reuse. Or the vending machines could charge a deposit/minimum and (if you were reasonably lucky or had used a credit card to buy it) accept used cards for deposit/balance refund. I don’t see how the MTA is ever going to get what they/we want from a bank card without at the very least shelling out extra dollars or a percentage for special service. They probably need to bite some bullet and get their own (or some other transit agency’s) system on some kind of MTA card; then, if they are lucky, perhaps they can get a bank interested in piggybacking their credit card onto it, instead of the other way around. That way, whatever special smarts that work for transit will definitely be supported by the card and with decent negotiating, some kind of deal might be made for processing support with the banking types. Even if going it alone, finding local talent should be easy – there is no shortage around here of people who like working with money, for better or for worse.